Think back to a time when you visited a family member that you had never met before. You might have to dig a little deep. Remember the feeling of walking through the doors, the warmth of the environment, the unexpected yet sudden familiarity. Maybe you were a child, playing with new cousins or toys among the comforting sounds of background adult chitchat. Or maybe this happened later in life, and it was that fresh but intimate conversation from which you drew comfort. Recall the instant bond that forms between the welcoming eyes and honest words of related strangers. These are the innate ties of familial relations. There is nothing quite like the emotions felt in the presence of family, the unique synaptic firing triggered from a sibling’s embrace, an unquestioning, natural trust and connection between shared blood. But we as humans of the recent past and westernized world get to reap the additional benefits that accompanied evolving from our mammalian kin, breaking off from traditional practices and tribal lifestyles, and embracing an interdependent and unified society. Jared Diamond explains these benefits best in his most recent book “The World Until Yesterday,” in which he sheds light on something that most take for granted – the fact that we can live among and walk past thousands of strangers each day without fearing for our lives and having the once instinctual impulse to attack and protect oneself when confronted with an unfamiliar face. Those benefits, however, aren’t merely confined to brushing shoulders with hundreds of strangers on a daily basis or trusting the food served by someone you don’t know. We are quite fortunate for these luxuries, considering there are still human societies and a whole biosphere of animals that, barring some exceptions, remain isolated and avoidant in order to survive. But what I am referring to is a connection among strangers that has evolved right along with our species, allowing for us to feel the same warmth, develop a similar trust, and succumb to the firing of those unique neuron pathways, beyond the intimacy and security of family. Traveling alone has made me much more aware of this bond. As social animals, we thrive on sharing experiences and feeding on the human connection. However, when we find ourselves in a structured, routine lifestyle with existing social circles, complacency generally overpowers the urge or desire to spark a conversation with strangers, let alone develop more meaningful relationships. We become experts at small talk, always finding new ways to describe a sunny day but rarely encountering new faces at the dinner table. On the road, things are much different. When each day presents completely new and foreign situations, every smile becomes an invitation to chat, and complete strangers start to form a global family. In many respects, traveling solo is the least alone one will ever be. The past 90 days of traveling have shaped my global family in ways that I couldn’t begin to imagine. From the streets of Pula and a mountaintop in Montenegro, to a tiny Slovenian village and even the side of a motorway, friendships sparked from the most unlikely encounters. In this post, I would like to share another one of these encounters. If you were able to channel that memory, focus on those feelings now. I most recently stumbled upon them unexpectedly. 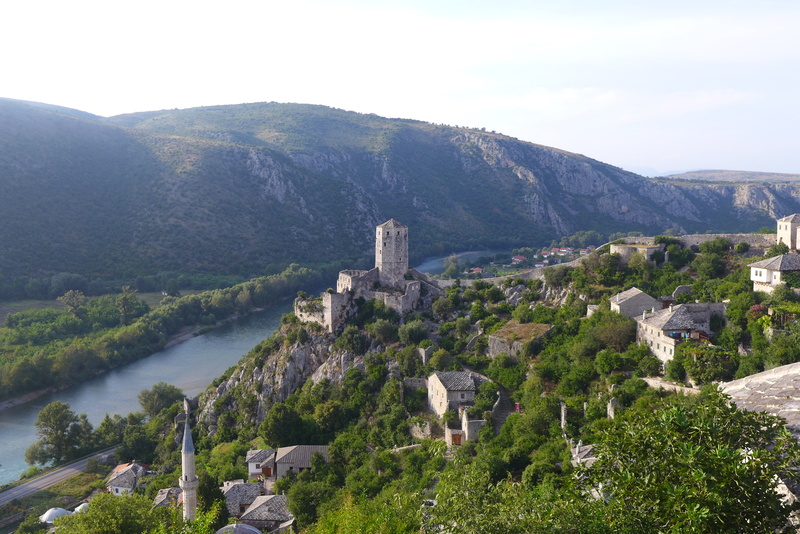 Upon a few friends’ recommendations, I set aside two days for a trip to Mostar, and while anticipating a historical, educational visit, I also found a welcoming home. Walking through the brown steel gate located halfway down the alley, the first thing that appears at the end of the driveway is the exterior of a small home. 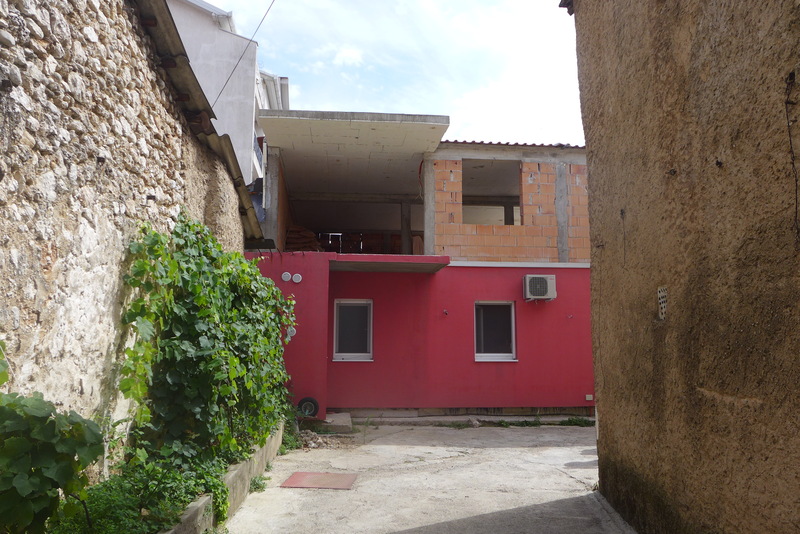 A painted wall of the renovated ground floor sits surprisingly stably under a second story of ruins. Much like most of the abandoned structures on the Muslim side of the city, the top floor is a jarring remnant of the local government’s indifference and negligence since the end of the war. Yet this minor detail is quickly forgotten upon turning the corner and taking one step into the backyard of Hostel Majda’s. In a city still bearing the crutches of a recent tumultuous past, Majda’s immediately seems out-of-place. A maze of streets ridden with bullet holes and structures left to crumble leads to this oasis, presenting an unexpected vibrance. Just as you begin to take everything in, Majda pops out of the house, greeting you with homemade ice tea and a slice of cake. 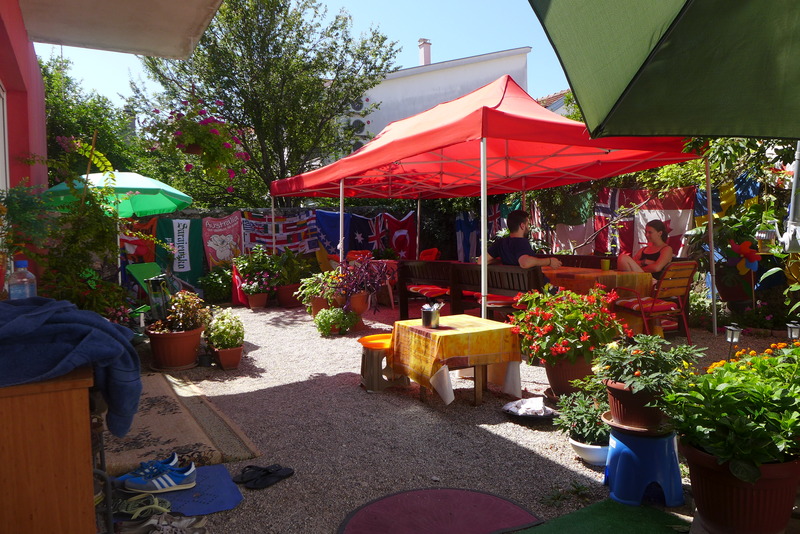 This sort of hospitality was definitely something I had been accustomed to growing up, but would never expect from a hostel. 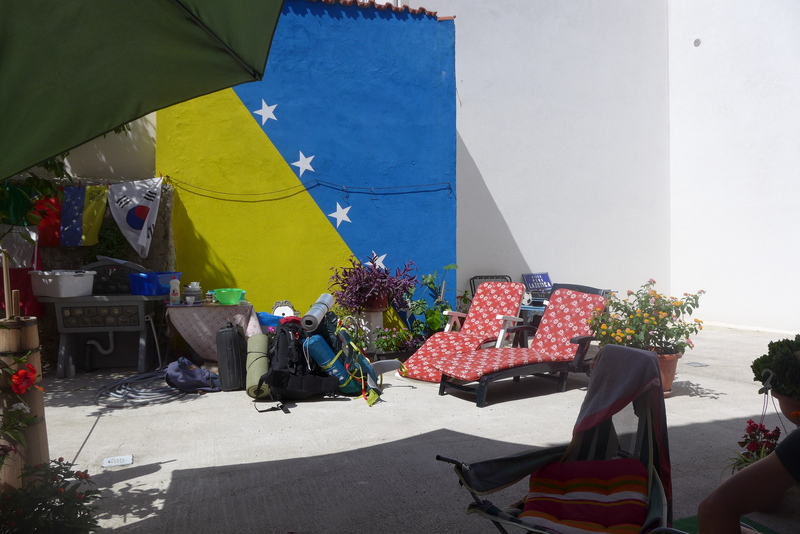 Although lucky with my accomodations throughout this trip, after staying at a few hostels that had some major drawbacks, all I really looked for during my stays was a clean bed and friendly smiles. 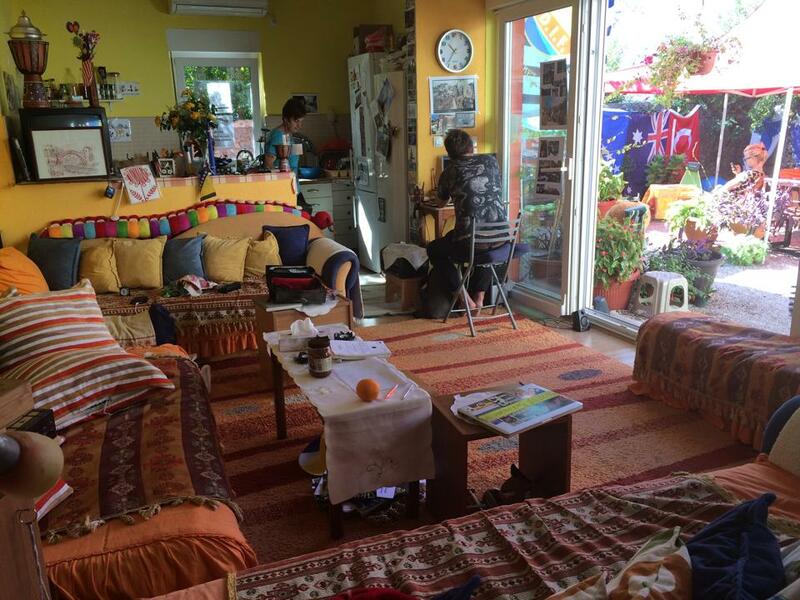 What I found at Majda’s, even within the first few minutes of arriving, wasn’t just good and professional service..it was a genuine care and connection. And Majda’s hospitality didn’t end there. 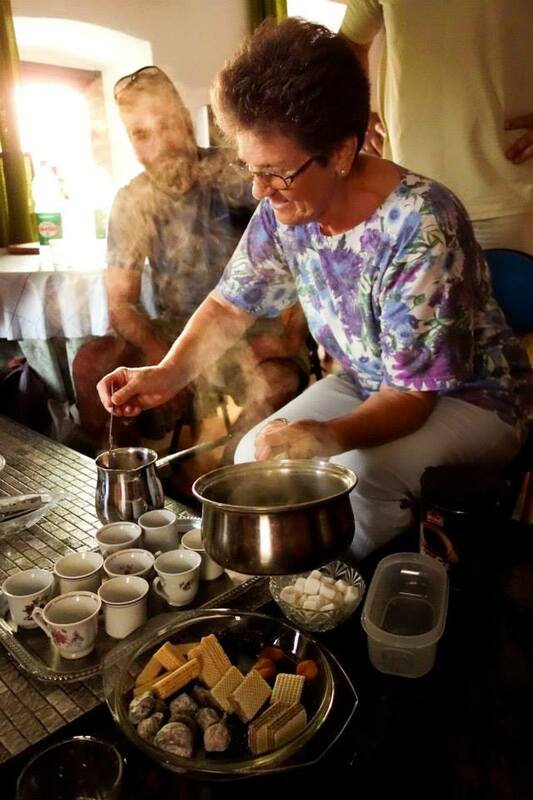 Mornings began with a huge, delicious breakfast that Majda prepared with care for hours. 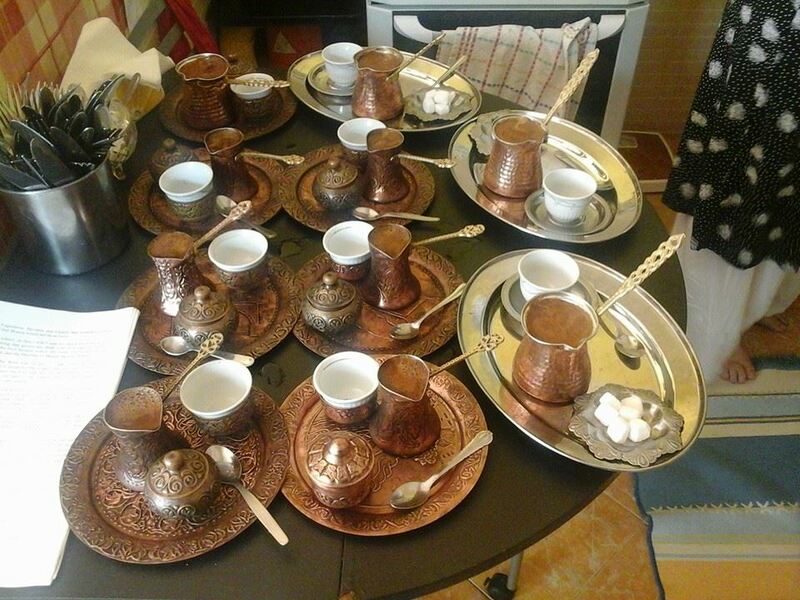 Afternoons at 5 pm, anyone who was lucky to be around enjoyed as much Bosnian coffee one could ever want. When lounging in the comfortable living area or the patio it opened up to, she would always be around to share a laugh or tell a story. 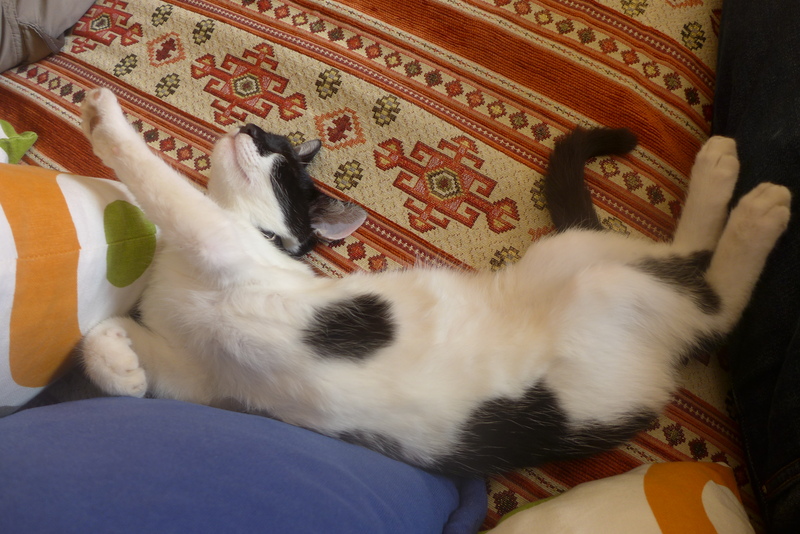 The only times it would be difficult to get her attention were when she was playing with Batman, her secret obsession. If these reasons were not enough to fall in love with this place, the incredibly comfortable beds and amazing showers would surely seal the deal. But cozy couches and seemingly endless edible offerings are not enough to fully convey the charm that is Majda’s. One has to be introduced to the whole gang. Meet Martin. 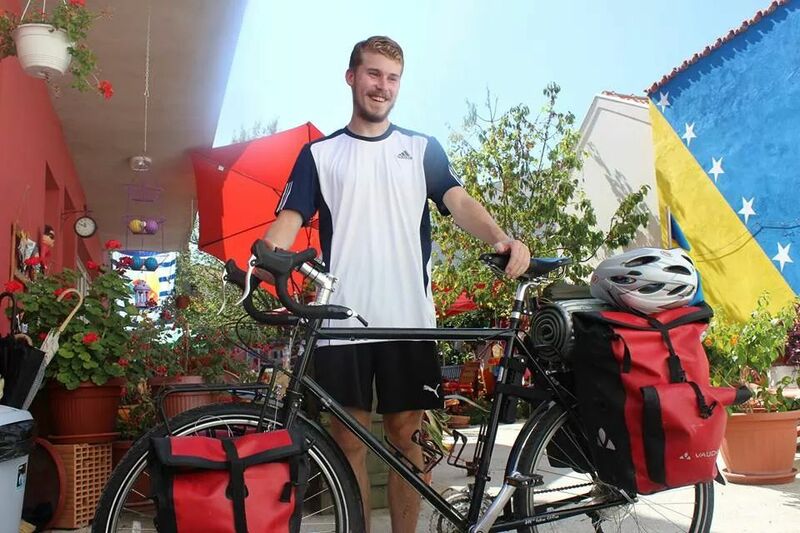 In his early twenties, Martin left his home in Sweden a few weeks before arriving at Majda’s with the main objective of getting to Istanbul…by bicycle. I admire Martin’s grit and adventurous nature, especially considering that this was his first experience with cycling. 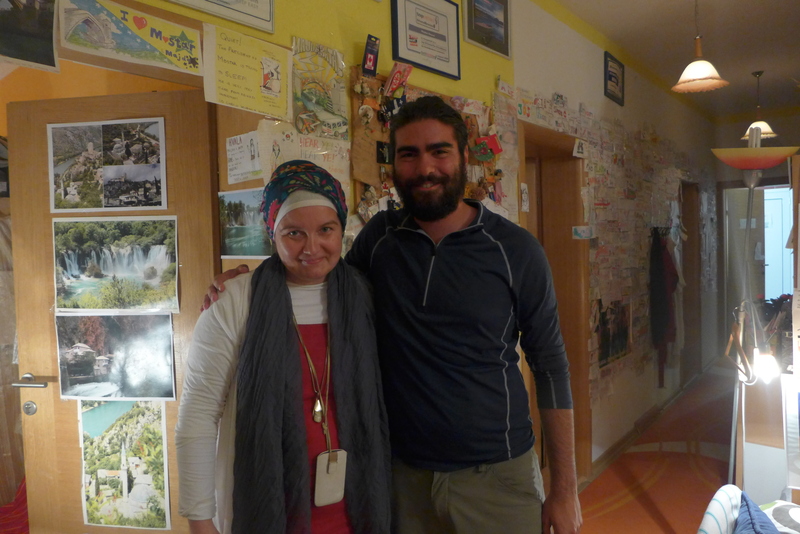 After thousands of kilometers of mountainside roads, scenic coastal rides and fortunately calm traffic, he discovered Majda’s, got a job helping around the hostel and decided to stick around. 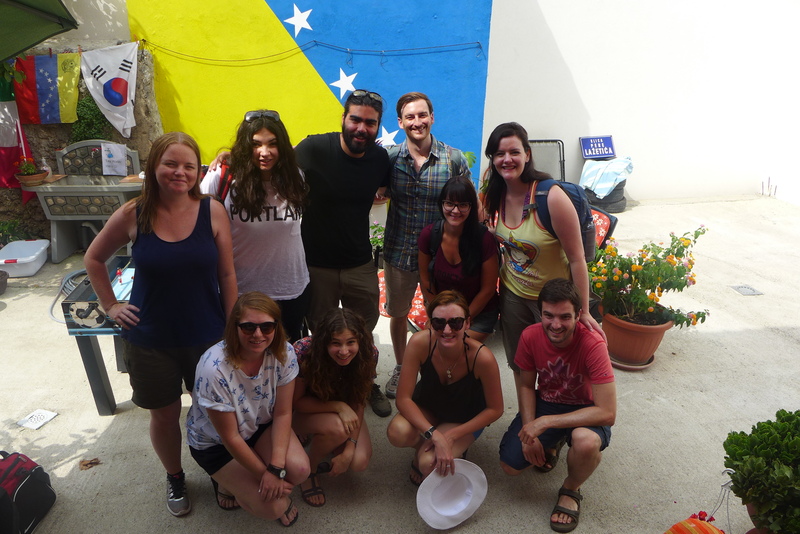 Having worked for three weeks by the time I arrived, he had become a local, taking guests through the familiar streets of Mostar and teaching the traditional practices of drinking Bosnian coffee. After extending his stay to a total of 47 days, Martin hit the road once again, ready to tackle the rest of his journey. 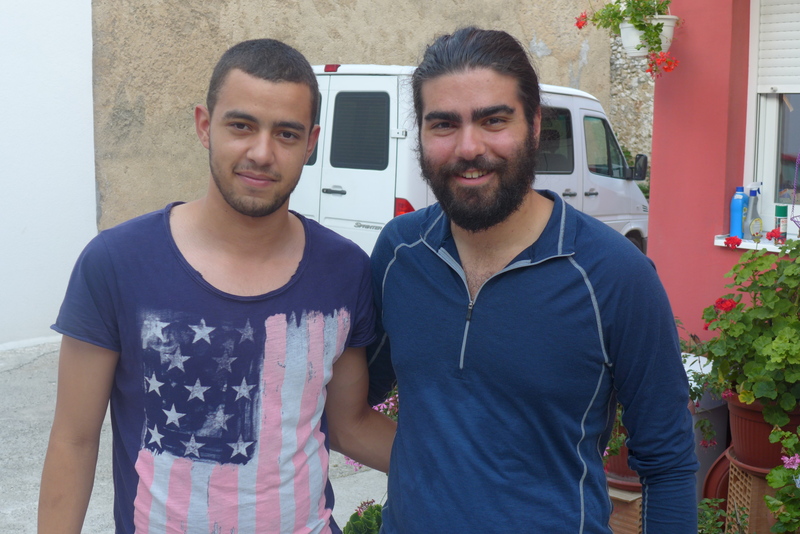 I wish him a safe and exciting cycle through the Balkans and hope to meet up again in Turkey in a few months. 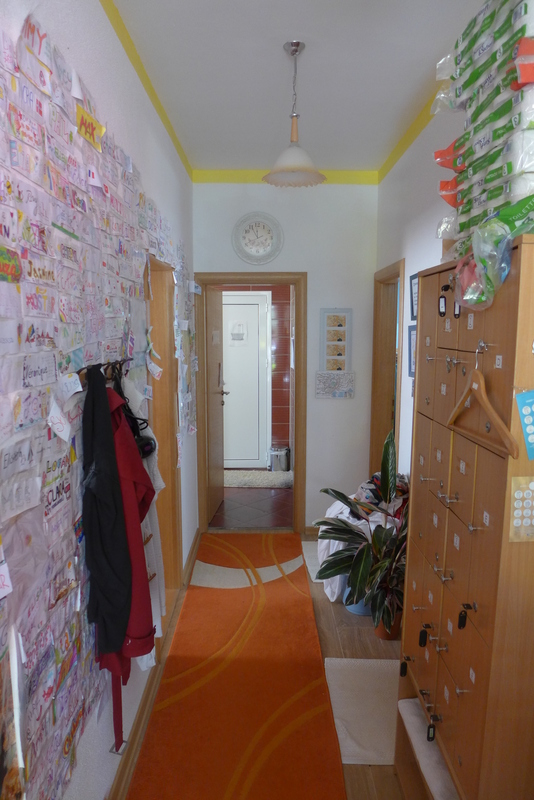 Just like Martin and countless others whose name tags now decorated the corridor in Majda’s, I joined the “one more night club,” extending my stay by one more night when I woke up each morning, only to find that Majda had already saved me a bed. It had become a home away from home, and the longer I stuck around, the more difficult it became to leave. And another reason was my friend Hamid. 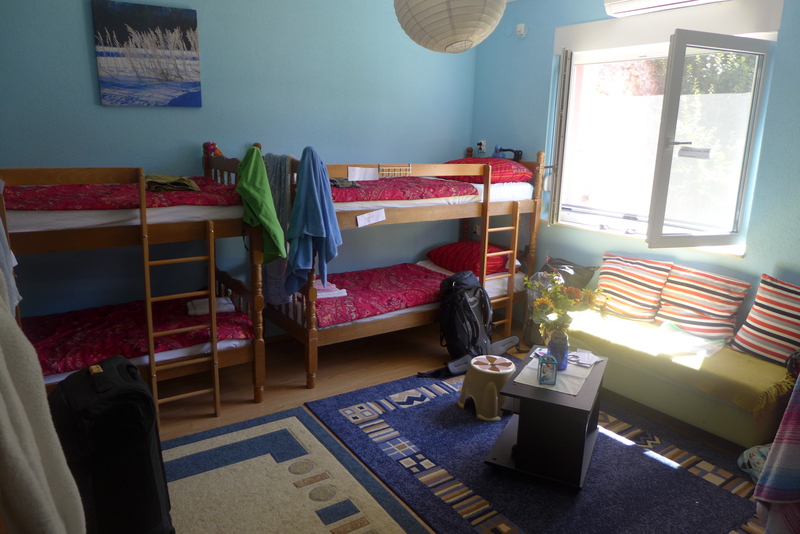 The son of one of Majda’s close friends, Hamid works at the hostel during his summer breaks from studies. Quiet at first, Hamid really began to open up after a few days of getting to know him. And his company was most enjoyable when I got him in front of a backgammon set, an activity that became a nightly engagement for us. Last but certainly not least is the life of the party, Majda’s brother Bata. His face says it all. 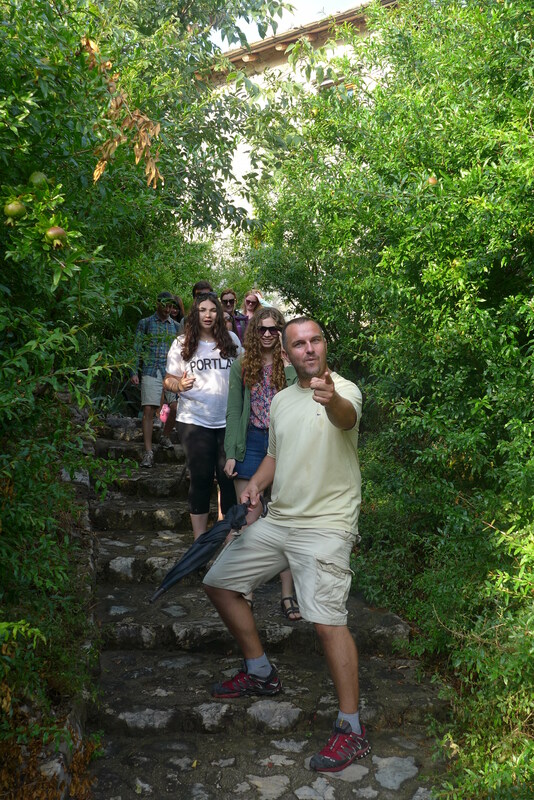 Leading an unforgettable tour for the guests at the hostel, Bata’s endless energy, as well as his constantly engaging and huge personality, doesn’t leave any room for a single dull moment during his 12 hour adventure. 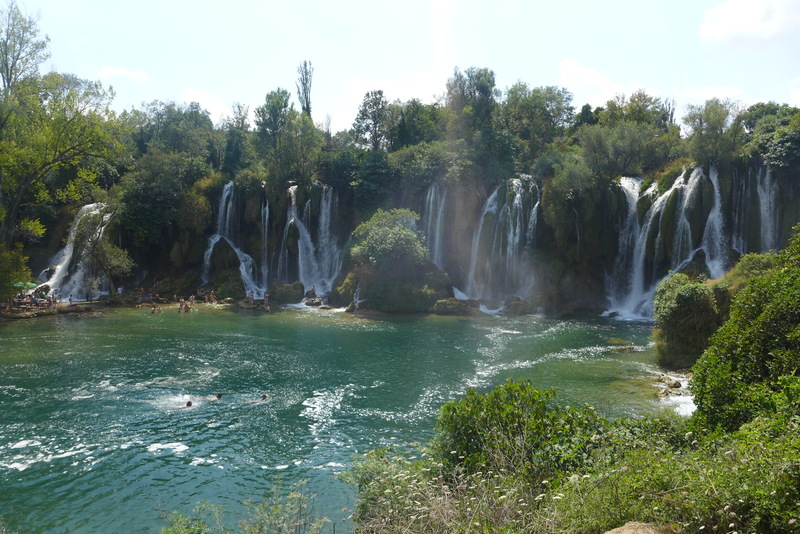 Taking us back in time through personal recounts of the war, his tour is not for the faint of heart, providing a both physically and emotionally taxing journey through an informative ride through Mostar, chilling swims in the beautiful Kravice waterfalls, a visit to the medieval town of Pocitelj, and a mystical nightime stop at Blagaj, a 16th centery Dervish monastery. With many surprises along the way, Bata engaged us, challenged our knowledge, pushed our boundaries, took us out of our comfort zones and shared his most valuable and honest offering – his story. Dropping the group off at the end of the night, he managed to leave everyone with a smile on their faces and a yearning for more. Without giving away too much about the tour, here are a few clips and photos from our adventure. 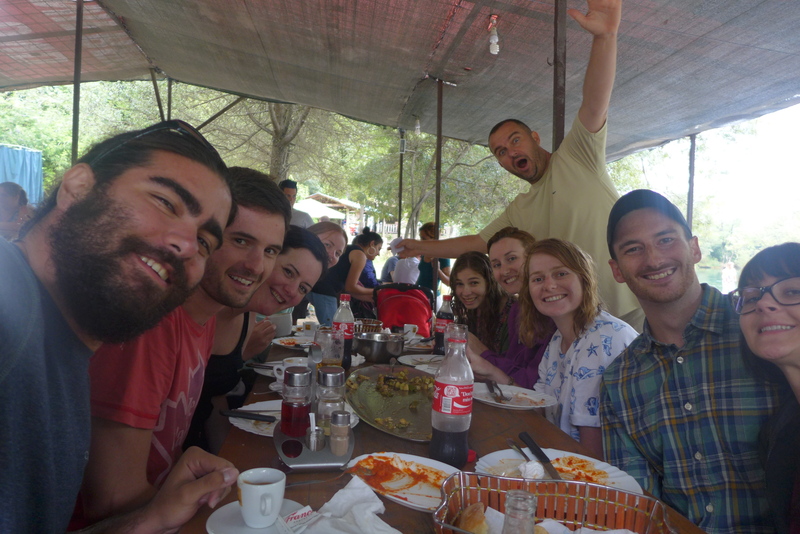 After seven days, it was time to move on, but leaving Majda’s did not feel right. 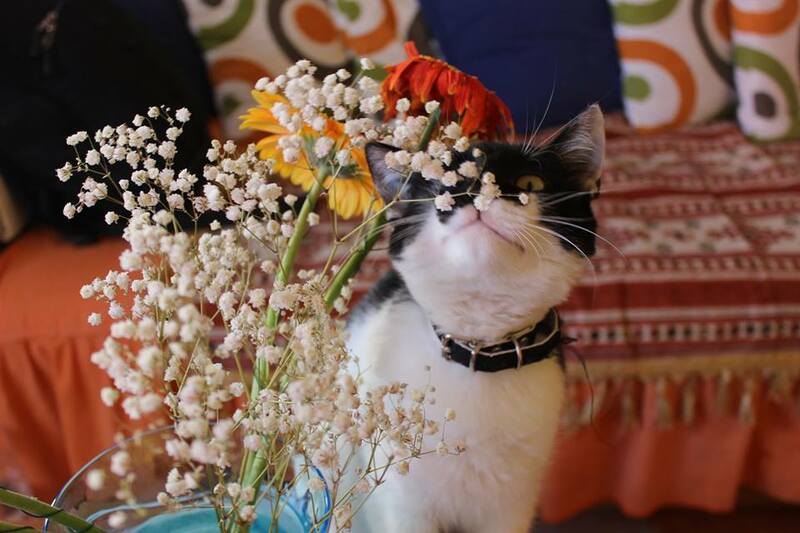 The house had begun to feel like my own, and I had gotten used to the hum of chatter coming from the breakfast table that would wake me up in the morning, Majda’s unfettered joy every time Batman assumed a cute pose (which was always), and the constantly changing but always vibrant energy brought by every new guest. 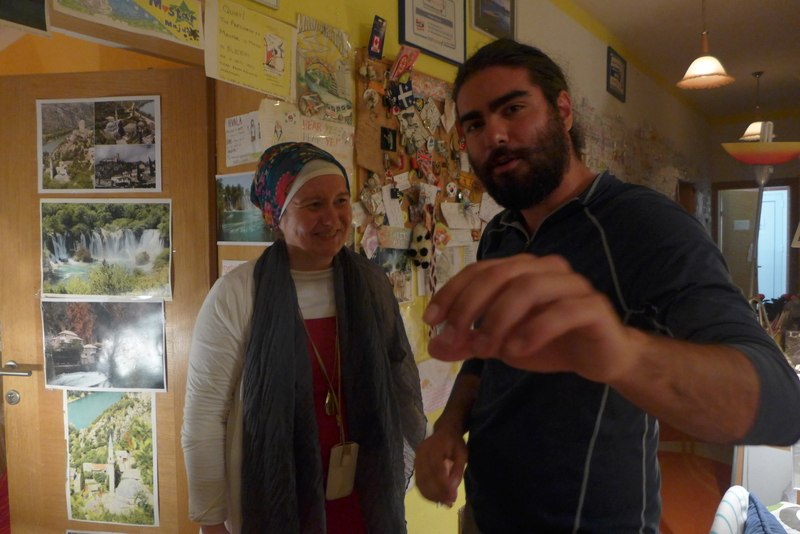 Now I have a home to go back to in Mostar, and until I return, I can live vicariously through the experiences of friends who I have sent Majda’s way. YOU CERTAINLY WOULDN’T GET THOSE WARM FAMILIAL FEELINGS STAYING AT A HILTON HOTEL, THAT IS FOR SURE.